We only supply commercial strength Gazebo hire structures for your business and private events. 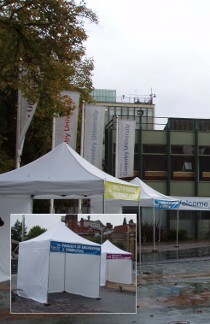 Gazebo’s are also known as mini marquees, instant marquees or pop up marquees. For additional items to go with your gazebo hire such as chairs and tables, see our marquee equipment page. Aluminium Framework canopy is 100% flameproof and waterproof. All seams are heat proofed for extra protection against the rain. Flexibility of instantly removing or adding walls for entry or exit points. No central or internal pole restrictions. Can be set up on grassed areas or hard surfaces. Can be set up in less than five minutes by our professional team. More durable than other alternative plastic framed structures. Show your businesses professional image. Create space for your exhibition and display area. Get maximum exposure from promotional banners. Easily and quickly construct as a temporary work shelter. Your own branded walls and roofs for every event. Popular usages and requests for Wedding Gazebo Hire. Champagne and Canapé reception area. Shaded outdoor areas for guest. Hog Roast and BBQ areas. See our Wedding Marquees range for you main event arena. “I would like to thank you all for your support in making the Open Day on Saturday a success”. Gazebo hire for your home. Provide children a shaded area for sandpits and paddling pools during summer parties. Used as chill out areas for your guests or smoking shelters. 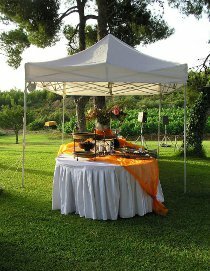 Catering shelter for your buffet or barbecue. To check availability Get Your Quote Here or feel free to call us on the number at the top of the page. Solihull, Birmingham, Rutlands, Coventry, Northamptonshire, Leicestershire, Nottinghamshire, Derbyshire and surrounding counties.